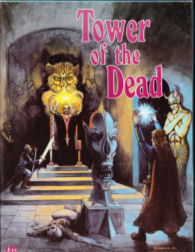 Tower of the Dead is the first in a continuing line of Site Supplements for Powers and Perils. In this supplement, the party must use their imagination and cunning to combat the forces of Nilgeranthrib and destroy him. Tower of the Dead should only be used by groups that are experienced with the Powers and Perils system. The party that becomes involved in it must face powers that are beyond the ability of a novice to defeat. Knowledge of the Powers and Perils game system is required in using this supplement. This book details all of the adventure-specific information that the Referee will need to run the adventure. The map that is located on the back of the box details the strategic area that the adventure occurs in. it will be used to plot the party's strtegic movement during the adventure. The other item in this box is the Referee Control Screen. The Referee Control Screen contains important tables from this book, notes that will help the Referee use this book and general tables that the Referee will use during the adventure. As a final caution, the enemies that are faced in this adventure are powerful. The Referee must use discretion as they come into play. Any encounter with one of the dominant magic-users should be explicitly detailed to provide the party with all of their options. In this way, they will have an opportunity to make choices which could allow them fatal confrontations and/or succeed in destroying the Lich. Unless you, as a Referee, make this effort, the party is doomed. An entire party of six or seven adventurers, against th power of Nilgeranthrib alone, is outclassed. Unless they have some other aid, or the detailed situation gives them an opportunity to decide their own fate, they are likely to die. Scan of the original boxed set.